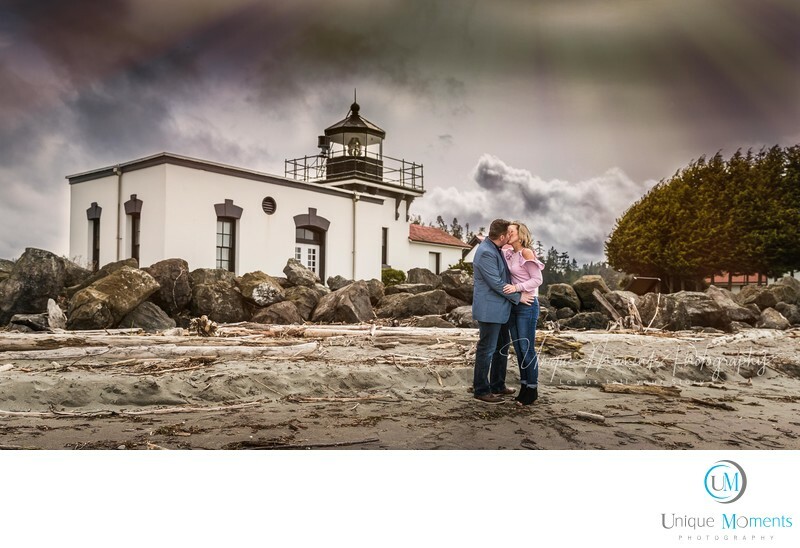 Unique Moments Photography traveled to Hansville Washington to the Point no point lighthouse for an engagement session. On what has turned out to be the wettest April on record for Washington, Chris and Carissa had a 3 hour window of opportunity to get this engagement session in. It had been raining for 12 days straight, plus Rain on all proceeding weekends and it looked like no end in sight to get outside to do an engagement session. So we all got on the net and found doppler Radar and we soon discovered that the area of Hansville Washington which sits at the top of the peninsula in the Puget sound area . The area was where the eye of the storms was passing over and it was supposed to be clear for 3 hours with no rain. However a wind warning was in place. So we looked at our options for this session and we all said lets go for it. The worst that was going to happen was we were going to get a little wet. Rain or shine, this engagement session was a go. We packed the umbrellas and headed for Hansville. It was pouring in the Gig Harbor- Tacoma area and it rained all the way until the Turn off from Interstate 3 to go to Kitsap. By the time we got to Point no point the rain stopped. Holy guacamole Batman, the weather man got it right. We got there with No rain in sight and tons of swirling clouds . Man talk about Wind!!! The entire sound was white capped and on the north side of the lighthouse you could not stand straight without the wind blowing you off balance. So we sought some shelter on the west side of the lighthouse that blocked the wind, and we got some shots in. It was quick and at some point we all looked at each other and said let go find someplace else. We still had another hour before the rain was supposed to start so we found another location to finish up the session. We all had a great time and wrapped things up in 2 hrs. On the way back home it started to pour. It rained for the next 5 days and its still raining as we right this blog post. Washington has its challenges. But with great people like Chris and Casissa, its a very minor inconvenience. Point no Point is an awesome location for engagement sessions. Highly recommend. Sandy beaches, west facing beaches, nice area. It doesn’t get any better for Washington and the Kitsap areas.